Kim's Halloween Party Ideas That Work! Below are some Halloween Party ideas that work. All of these ideas were tested by hundreds of children and adults, and here are the results. I hope they provide you with a guide to a quality, fun event on Halloween night, and for your home parties. Enjoy!! The front of the house should look creepy, scary. I had a cassette player in the window, playing some spooky sounds. I also had a cheap strobe light shining against the house. Do not shine the strobe in the direction of the Trick or Treaters, as it will blind them, and you will lose the effect you want. Rather shine it on your decorations. I put a skeleton in a chair, see the decorations website. This gets the people to look to the right as they come in. I opened the door from their left. Somehow you want them looking around like this. I read once it creates a mysterious atmosphere. I would greet the kids and tell them that my family and I were just about to sit down to supper, when we heard the door bell ring. I then invited them into my house. Note: If you are apprehensive about letting kids into your house, you may want to set the following events up in your yard or garage! In the living room, I had a fog machine going. I had the 7-foot Jason guy in a dark corner. He looks even bigger in the light. Click here to go to the Halloween decorations site to see the 7-foot Jason and other ideas. On the sofa I had a styrofoam head guy covered with a simple white sheet. I had a prop in every chair. The furniture was all covered with white sheets. I told the kids that I had some relatives visiting, and they were pretty tired from their long journey from Transilvania. The fog and low lights, candles in this case, create an eerie glow. I tell the kids to just follow me to the dining room to meet Uncle Eyester...so called because of his Eye problem...I tell the kiddies. Uncle Eyester is another prop, seated at the table, with a plate before him. On the plate I had cut a plastic black rat, and painted red blood on him, or you can use Kyro syrup with red food coloring. It works great, just remember it stains badly. Beside the table I had a Plexiglass guy, see decorations website for details, laid on the floor. I told the kids it was my son's grandpa. He had died when a Vermillion Bat (something I created) bit him. Then I told them that my son would not allow me to bury him just yet. Then I added "Here he lays. I hope he doesn't start smelling anytime too soon. After all we have to eat supper". The kids just eat this us. I told them I was just about to fix my own supper, and asked them to join me in the kitchen where they could help me fix supper. In the kitchen I had jars and bottles everywhere. I use small white lights behind everything to illuminate it from behind. This works so well. Here's another photo. On the stove I had a pot with a fake plastic hand sticking out of the water. I had a lid just laying over top but the fingers stuck out nicely. I had plastic snakes and insects, all over the counter. I got a talking fish bowl blender, from Spencers Gifts. Click here to see the blender. You can order one online too. It was a solid hit! The blender is a toy that looks like a real blender used in a kitchen. In reality it is a fish bowl. But the buttons once pressed make sounds that sound like a running blender. There are 3 different sounds, and on one button it sounds like the fish are talking to the kids. In the blender I had put gold fish. I would tell the kids I needed help making supper. I told them I was making "Goldfish Stew", and asked them to press the button to help. The blender would sound or the fish would say "Hey...what's the big idea". This toy, which cost me about $20, was lots of fun, and the little kids just loved it. I would then let them smell different things in jars. All these ideas are on the decoration site as well. For example I put Parmesan cheese in a jar. It stinks, but I tell the kids it's zombie breath that is used for seasoning. After the kids smell some things or look around, I told them... "I guess you don't want any of my supper huh? Ok...you want some candy instead?" Then I would serve them some candy. I would let them go out my back door. When planning a party, remember to plan every part of the event. This means providing decorative foods, drinks, music, setting, and entertainment. Your Halloween decorations don't have to be perfect, or detailed, in this setting to really work. The lights should be low, fog adds to the mystique, and sound adds to the setting. A hay ride, haunted forrest, musician, fortune teller, pumpkin carving, places for a photo shoot, 2 haunted houses, music and dancing. The Haunted forrest was great, and was held along some old four wheeler trails, that were quite narrow. At the entrance of the trails, I had a sign warning the visitors that it was indeed, a haunted trail. Whoever you have to lead your guests needs to have a Coleman lantern. These lanterns throw out a good amount of light in all directions. The path may be very dark, and if you have a crowd of people to walk through the trails, you will need something more than just flashlights. All along the trails we had props or people to scare the visitors. Lighting along the trails was simply done with votile candles. We took one-gallon milk jugs, cut off the tops of them, filled the bottom with some sand, and stuck a small candle into each one. It gave just a faint light, but was enough to light all of the props. I did assign one person to each candle for safety purposes. All debris was removed around each milk jug as well, and each was set well off from the path. Props included large spider webs that stretched thru the trees, and had a black spider in the center. The spider was very big and made from old, black clothes. In the dark you cannot see the detail, so it looked quite real. We even had some glow in the dark spiders. It is great if you can have the web stretched out and to have a live victim in that. Someone acts like they are trapped in the web, and screams for help. Other props included a huge grim reaper. This is easy to make. Get a plastic skeleton face from Walmart, Party City or Big Lots. I got mine for just $1.29. Tie this to a tree on the trails. Then make the suite for him, using black garbage bags. You can make the arms from PVC pipe or wood. Hang the bags off the frame, and be sure you make this figure tall, over 6 feet is perferred. Having a radio or cassette player nearby with spooky music really adds to the setting. Another prop included making a Pendulum. For this prop I had 2 people working it. The Pendulum was made from wood, and the blade was painted silver with red paint for blood. We cut a small hole in the handle. Thru the hole we ran a rope that was tied to two trees, so it would swing freely. A live victim was laying under the swinging blade, and the other person acted like an executioner. The victim had on a white shirt with red Kyro syrup on it for blood. The other had on jeans and a drak shirt, with a black hood. Eyes were cut out of the hood so the executioner could see. I made the hood by taking a piece of black fabric and cutting 2 holes in it for eyes. Simple. Place settings and scenes to get people's attention, then have a person dressed in costume running about to kinda "ambush" your guests. I did this on the trails. I had a scene with some skeletons tied to trees. It was illuminated with candlelight. While the guests were looking that way, a friend, dressed with a Hockey mask, and equipped with a chainsaw, came running by and scared everyone half to death. I also saw this same thing while Trick or Treating once with some children. A man was sitting way up on a hill, in his driveway. He had the lights on, and you could see he was handing out candy. To get to the man you had to walk up a driveway past some shrubs. When we walked by the shrubs, a kid in hockey mask with a chain saw came running out and behind all of us. Needless to say it scared all of us, and was quite memorable. We had music playing on the entire route of the trails. I don't have lots of fancy equipment, so we used radios with tapes in them, that were battery powered. I had someone assigned to each one to turn the tapes over when necessary. But if you can do it, CD's work best. They can be set on some radios to do a 'repeat playing', thereby giving you continual music. Speaking of music, I found that playing the soundtrack from the movie "Halloween" was very effective, even over scary sounds. 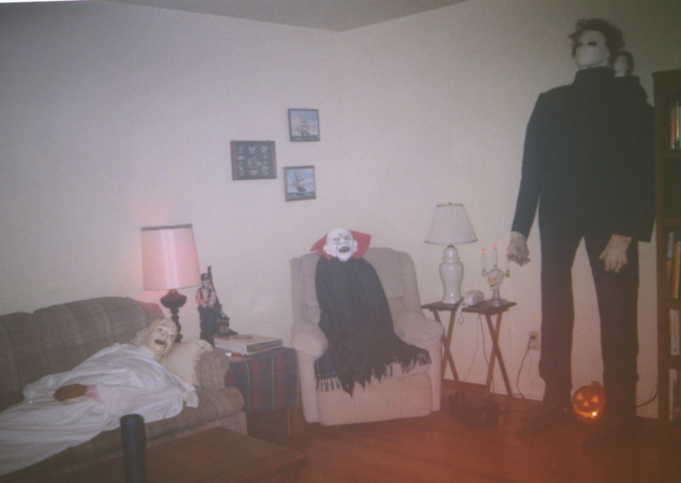 I also saw a guy's house set up like the movie "Halloween" with lots of little "Michael Myer's". It was very effective, as they were everywhere, and you didn't know which was a prop and which was real. Suddenly one came "alive", and it was very scary and effective. I had a friend with a wild wig on, dressed in white with a white apron on. He was supposed to be a mad or wild doctor, and he invited the kids to watch him perform surgery. Note this was very messy but very fun. He had a watermelon on the table, covered with an old sheet, and stuffing in various places to make him look like a person. He used the watermelon for the body or chest. Next to this he had 3 buckets of junk...one of salsa, one with spaghetti, and one with spaghetti sauce. I told you it was messy!!! Anyhow he had a toy knife, a stiff one, and would run the knife in the buckets and then sling the stuff around the room. He also had an old chain saw that he used to saw on the watermelon. It looked like he was sawing his patient in half, and when he put the chainsaw in the bucket of salsa it want flying. Please note the chainsaw was old, and slow. I would advise great caution when using one in a scene. Normally the chain is removed just to give the sound, and this would have worked just as well. After my guests had finished the trails they would get back on the hay ride. There we had a person under the hay that would jump out and scare everyone. Inside the house we had a Haunted House all set up. On the stove we had various feet and arms in pots and pans. Nothing was turned on, but just set on the stove. We had things in jars too, laid on the counter. One jar had a plastic mask in it with some water. We used some food color to dye the water red. Then we used a fish tank air compressor to add bubbling air to the water. My son added some dishwashing detergent and we got bubbles too. Little kids, especially, liked this. The most Haunted House in America. It hails a fabulous tale of a slave girl named Cloe. Click on the name to go to that website. Although now gone, Borley Rectory was reported to be the most haunted house in the world. It was located in England. Below you will find some submitted ideas which were sent in from different people who wanted to share their party and decoration ideas with you. For photos of Joanna's idea click HERE and HERE. My corpse was inspired by your plexiglass man. (Editor's Note: See our main website for details on the Plexiglass Man. You can find the idea at www.kingshaunting.com.) I also used a styrofoam head, cut out eyes, nose, and mouth. I then took my knife (as you suggested) and made random cut marks all over the head. I stuck the head on a shovel handle and stuck it in the ground to steady it. Using washable craft paint I got at the local thrift store for $.69, I poured the gray paint in my hands and rubbed him down. The paint really sank into all the "cuts" and made them look very real. After the gray dried, I poured the black paint in the eyes, nose, and mouth and used my fingers to spread it around. I went to town and got two cardboard boxes from behind the dollar store, used a box cutter and cut them to make a coffin shape. I then duct-taped them so they would stay together, creating one long rectangular box. I painted the "coffin" black and sprayed splotches of gray paint here and there on it. I then took the white part of an old torn bedskirt and laid it flat in the coffin and then laid the head in. I also had an old curtain that had a lace hem. 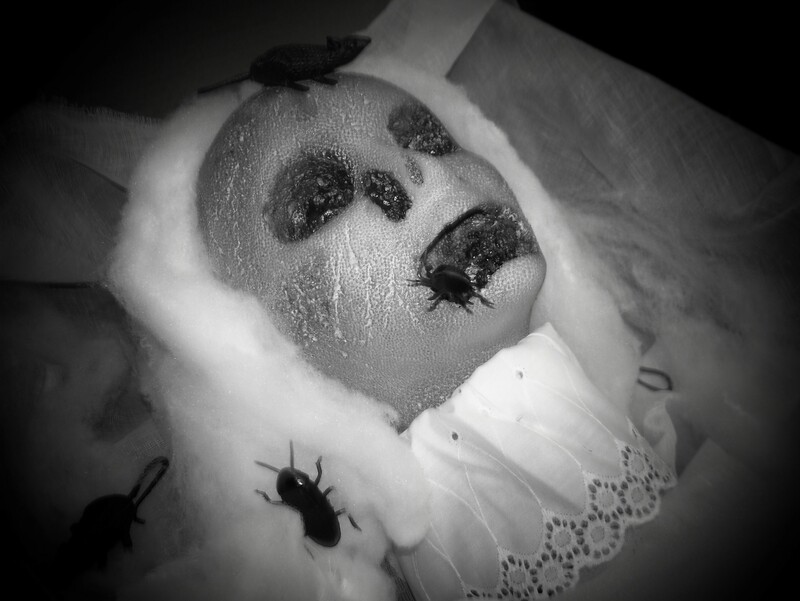 I cut about a 6 inch piece of the lace and put it around the head's neck, so this is a female corpse. I then strung store bought spider webs back and forth across the top of the box to hide the rotting corpse and then placed roaches and rats in the corpse's mouth and head and all in the box. I thought it turned out pretty good. I'm going to also make a tombstone before Halloween and call the corpse "Here Lies Judith Myers, sister of Michael Myers". After all, Michael is standing in my window! Here is one for home that works great! The kids will walk by a large garbage can and someone inside the can is yelling "Hey, let me out! Get me out of here! Hey, it stinks in here! ", etc. The trick is not to put some poor soul in the can, but to make a recording of someone saying these things. I spoke extemporaneously for about ten minutes, and then duped the tape repeatedly until I had a 45 minute tape. Then dupe the 45 tape to the other side of a 90 minute tape and hook up a tape player hiddend somewhere very close to the garbage can. Fools even adults! Click here to view a wonderful Decorations and Ideas Website submitted by Cheryl and son Wyatt of Tacoma, WA. They used the directions on the main Halloween decorating site to make some of their ideas come to life. 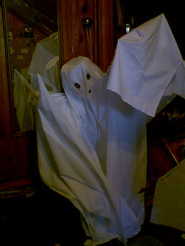 Make simple ghosts for practically nothing! First, clean out a couple of plastic gallon milk containers. These will be the heads. I rinsed mine out and let them dry upside down for a couple of days in my laundry room. The �body� of the ghosts came to me while I was bundling up branches from a tree my husband had cut down. I took 2 branches, one per ghost, that had a vague bird foot-type shape: head, 2 arms and a long thin body; think of a capital Y. Set the empty milk gallon upside down on the �head� branch. Even though it�s going to be covered up, you might want to use some twine to tie it securely to the branch. Next, take some old white material and drape it around or over the arms of the milk gallon and the "Y" frame. (Check for remnants at your local fabric store�that�s where I got mine.) Rip or fray the material before draping and use two layers slightly offset from each other; it will add to the effect. I used a staple gun to attach the fabric to the branches and just made various folds to hide the staples. Decide which side is the back of your ghost. Get a 10� length of twine, fold it in half and knot the ends together. Staple this to the back your ghost�s body: one staple above the knot and one below. This twine becomes your hanger.  Depending on how long your branches are, that will determine how your ghost balances when it�s hung. But if the balance is a little off, that�s alright too. It might blow in the breeze better! To finish off the ghost if you want, grab a black marker and draw on some eyes. Huge Snake Instructions, (The back part of the snakes head was left open and not finished). The head was the most difficult part. I used an old heart shaped fan I used to hang on the wall, but you could also use heavy cardboard and cut out the shape and put the markings on it. The face, I carved out of a styrofoam head by looking at pictures of snakes trying to get as close as possible to their look. You can use practically anything for his eyes, I used little bouncey balls cut in half and painted. Dowel rods were used for his fangs and sanded on a sander to give them the sharp point. Inserting the head into the hood This is the hardest part. I didn't cut the styrofoam head, but cut a hole in the fan hood and inserted it face first until I thought it was setting out from the hood far enough. Then I used Great Stuff and sprayed it around the front edge of the face and around the back edge. I tried to smooth it out a little to kind of mesh into the hood. After it was dried I had to go back then and trim some of the stuff to give it a more even look. My husband constructed just a square box made from landscaping timber, this is strong enough (2' X 2') to hold the entire snake. He attached a thick board into the center of the square and drilled a hole as close as possible to the center of the square to fit a rebar rod which will actually hold the snake. The head should probably be a little slanted going into the hood, this makes it easier to insert the rebar rod into the bottom of the Styrofoam head hole, only push it in far enough to feel that it will securely hold the head. I went to Lowes and purchased a 25 Ft. Box of 10 inch flexi-duct. Before you do anything with the head on the rod attach one end of the flexi-duct, (I used this to the backside) to the box. As you coil, you will see that it is slick plastic and hard to hold in place so we used dowel rods and drilled holes in the stand box to fit the dowel rods and for each coil that we made we put two or three rods down through the flexi-duct to hold it into place. You'll have to make the dowel rods longer for each coil you make. Leave enough flexi-duct that you will pull up and attach to the snakes head. Now, run the rebar rod down through the flexi-duct (all the layers) and put it in the hole that was drilled for it. Pull the flexi-duct up to the snakes hood. We stapled as much of the flexi-duct to each side of the hood as we could until it looked even. We then used joint compound to try to fill in and smoothing it up onto the hood to hold it tighter. After it dried we used even more compound to try and make it more secure. I even had so much compound on the front of his neck that I used my fingers and made half moon markings around his neck so it would dry like that. You don't have to do that though, you can just paint them on. Be sure that this dries well. You can paint him any snake color that suits you, we use tan and green. Once we had finished painting and letting him dry, I still was not satisfied. I told my husband he needed some scales and he said he was good enough. But, I came up to the house and happened to find a container of Quaker Old Fashioned Oatmeal, so back to the shop I go with my Elmer's Glue and oatmeal. It worked great, I just smoothed gobs of the glue on and then layed the oatmeal against it and it stuck. Then I had to repaint it again, but that was a great effect. My husband purchased one of those pump up sprayers cut the tubing and attached it to the water hose bent the copper end and inserted it into the back of the snakes head down to the back of his throat and Viola he spit venom (Water). 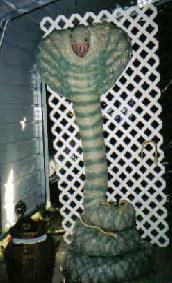 Note: Be careful when you spray paint the snakes head because some paint will eat into the Styrofoam. Paint the inside of the mouth any color you desire. We used red, rose, and pink at different places inside of his mouth. For a finishing touch, I used epoxy glue and put it all over the inside of his mouth let it run down off of his mouth and let it drip from his fangs. This gives it a wet look when it dries. Halloween Idea submitted by Mrs. Durant, the "Witch of Ceder Grove". I bought some tiny skeleton hands and some bones (which I will paint with blood red paint) to hang from the kitchen ceiling. I dress like an old witch with lots of props such as a thunder stick (when I press a button it lights up and thunders) or I hold a shrunken head that says Happy Halloween and jumps all around. I will feel a trick or treater's arm and say "I would like to have YOU for dinner" (meaning cook them). I ask them if they would like to come back and spend the night in the basement or attic. Not a chance! On the old blue cook stove in the kitchen I will have a pot of bones boiling for my "body part stew" and I have a "head" in the fry pan (it screams and shakes around). I always bake my favorite Halloween treat - a devils food cake (which is a cake pan but when I lift the top off inside there is a devil's mask which eyes light up and blinks off and on). Once I took a section of the table out and put someone under the table, put a cloth on the table with a hole cut in the center and put the cake pan on top. Imagine the surprise when the top was lifted and a real head was underneath! To get the kids in the mood. The week before Halloween I greet the school bus every morning doing some bazaar things. One day I might be seen burying a "body" or parts in my garden; another I might be dressed scary, have my lantern, and other scary props and suddenly start moving towards the bus. Of course, the bus driver plays along pointing me out to the kids. One time I pulled off my mask only to reveal another scary mask underneath. One of the best and scary things we do (and the kids LOVE it) is have my husband dressed in his brown hunting one piece suit and he wears a Frankenstein mask. He stalks the yard, peers into the windows or hides in the basement. All the kids know he is around but not exactly where he is hiding. They talk about him all year! Once he climbed into the back seat of a car and when the people got inside he leaned over and scared them to death! Living in an old house it, of course, is filled with antiques. I use the grain bin as a coffin; a long high back bench as a coffin and an antique large trunk as a coffin and the bottom of a wardrobe as a coffin. An old picture of two young girls has become a traditional story. As the story goes, these girls lived in our house over a hundred years ago. On one dark and dreary Halloween night they went out trick or treating. When they returned they emptied their bags of goodies right in the living room floor as all children usually do. Their parents retired upstairs leaving the girls to their candy. The next day when the parents went downstairs the girls had vanished! They were never seen again. The parents have asked that the picture remain on the wall in hopes the children will return to their home where they had very fond memories. Of course all my trick or treaters believe the story and think the picture has been on that wall for hundreds of years. 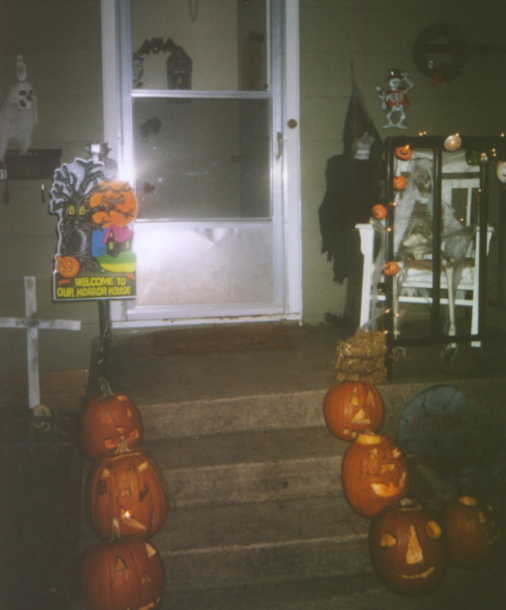 I put a Bates Motel sign in the upstairs window (it blinks off and on), a Jason mask with a candle in the side window. I have a monster lady who is my wee-gee board player. She summons up previous owners of the house. I have a ghostly, a mean ghastly piano player and monsters (in antique clothing) seated in the dining room feasting on severed fingers, spiders, etc. I have them rigged up with string which I can move with my foot which moves their heads as if answering questions I ask them. I set up a funeral parlor in the den complete with coffin surrounded with funeral parlor flowers, rats, ravens, candelabras. The person in the coffin usually turns out to be a previous trick or treater (fake) who had "an unfortunate accident" in my garden. He accidentally walked through the roses, etc. I ask the children to return to my home at midnight when I will bury him out in the Cedar Grove Cemetery. (No one has every taken me up on it). I have a "Queen of Halloween" which is a lady monster dressed in a orange formal gown who sits high on top of a cupboard. She is there to judge the costumes of the trick or treaters. Once she has selected the one she likes best she will come to their home to tell them. 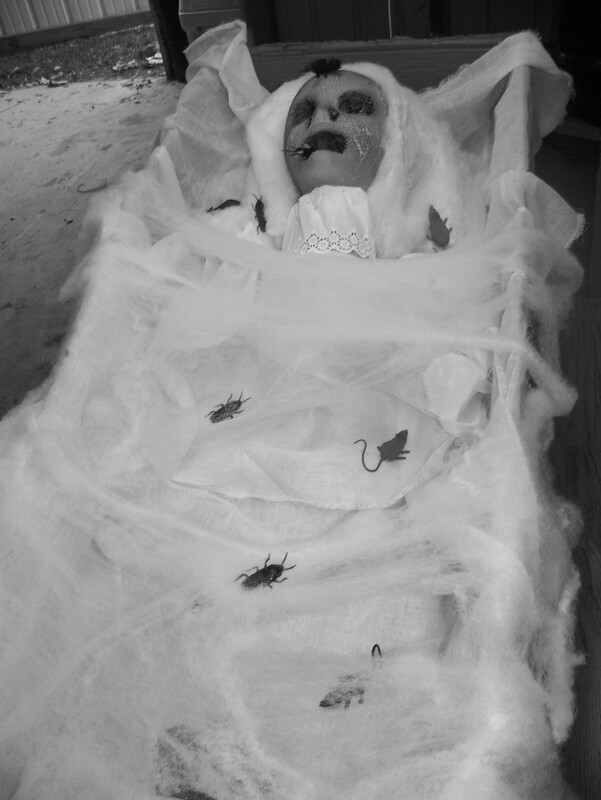 I caution the children to look carefully under their beds before they go to sleep in case she is hiding under there to tell them they have won the best costume prize. I have a head roasting in the fireplace in the "dead" I mean "living" room. I make a hugh tall man (over ten feet tall) out of an old black suit. I stuff the coat with newspapers and hang it on a hanger. I pin the pants to that and stuff the legs with newspapers too. Inside the pants legs a put a pair of crutches which can give more height. I then hang the coat hanger from the top of a cupboard and add a monster head which is a mask either placed over a head form or just stuffed with newspapers. I tell the children he is my yardsman to lost his legs in an unfortunate lawn mower accident. My kids always thought clowns were very, very scary. Therefore, I had to have a clown. I took a clown costume and stuffed it with newspapers. I hang him around a tall apple picking ladder in the dining room. He has on a very scary clown mask - and is holding a knife. Everything is constantly moving, bats and witches are flying, rats scurrying and lights are everywhere. I have a fog machine in the hallway. Halloween music plays out the window and throughout the house. I have a Cedar Grove Cemetery where I have made lots of tombstones and use discounted Easter cemetery floral arrangements. And then there is the food from brains (molded chocolate with strawberry jam inside) to rats, mice and body parts. The Witch of "Cedar Grove"
I made my own blood bath. I took a plastic childs pool filled it with some water and about 2 bottles of red food coloring. 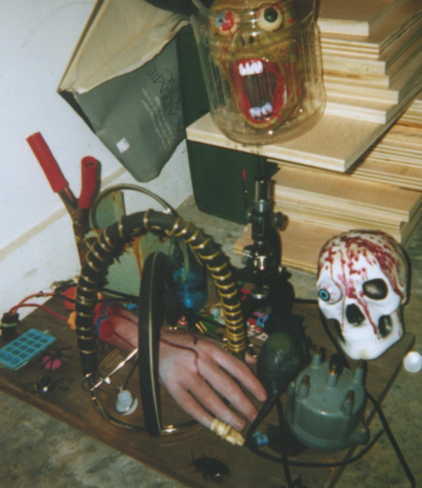 I then tossed in some skeleton bones and made a sign out of some old wood and just had it read......Blood Bath 5 cents. I'm thinking this year of adding a full skeleton wearing a shower cap and holding a bath brush. It was a big hit! First you take one of your cats spare litter box and scooper (If you do not have a cat, or don't have any extras, go to your local drug store and buy a box for about 3 bucks, a scooper for a buck) clean it out. Then take a large box of grapenuts, a box of powdered sugar, and a bag of tootsie rolls, unwrap the tootsie rolls. Mix them together, put them in the box, and let your guests help themselves!!! If you are serving the trick or treaters, I would recommend that you do not unwrap the tootsie rolls. Lay about 2- 1/2 yrds of packing sheet out and draw an outline of a ghost with both arms up (trust me it won't hang right any other way) as if to scare someone. Cut along where you drew the outline where you draw the face. Take about 1-2 yrds of fishing line and cut in half. Glue one string on the back of each hand. Then tie each string to a tree branch and the wind will make it move plus, you can almost see through it (sort of). I make the Zombie meat loaf and the grave yard cake, but instead of green icing I shall use crushed chocolate flakes or grated chocolate for earth. This Year I,ve bought some wheelybin black bags, cut down two sides to cover the kitchen ceiling over this I,m placing low voltage blue fairy lights for stars, a ghost fastened to the cieling lying almost flat and stretched across it all, cobwebs and hanging bats. Across the window I have a net of fairy lights multicoloured, over this I have cobwebs, spiders, skeletons. On a wall I have a red devil mask, for the eyes red glass stones, (the ones you place in vases to keep flowers in place) for the cape I use red crepe paper, By the time I've finished my kitchen is an Halloween paradise. I also use red lighting. Another idea for jelly is to use a face mask lining it with Clingfilm then decorate. Four of the three-ounce size Jello boxes, three peach flavored and one watermelon. If you must buy the six-ounce size, I suppose one peach and one watermelon would work. Put gelatine mix in large bowl and add boiling water; stir a couple of minutes. Add cold water and stir a little more. Stir in evaporated milk and pour into desired mold. Keep refridgerated until firm. After going through a 5 minute story about a confederate train that was sent up north to drop off spies, and was subsequently burned by the Union Army, I told them the train was responsible for running over and killing at least 38 people in 30 separate incidents. I told them it was a translucent blue and it roamed where there were no tracks. There was no warning other than a blast of the trains whistle before it blasted through the woods and mowed people down... so..."If you're ever walking through the pine barrens at night and you hear that whistle... look out!" Most of the kids sat there and said "cool story" or something similar. My friend Tom, who was hiding behind out stockade fence, let loose with a blast from an air horn and everyone jumped. Even me and I knew it was coming. It took them a few minutes to settle down after that one. They were laughing but you could tell they were worried about the train for a split second. Dry ice effects are really easy but it can be expensive depending on where you get it. We got 70 pounds for about $60. Dry ice itself goes directly from a solid to a gas (CO2). The warmer the environment is where you place it the more fog that is created. For instance; if you place a small amount of dry ice into a small pot of water that has been warmed it will produce an incredible amount of fog. Dry ice fog is also good because it's heavier than air and will always stay close to the ground. We typically use it on the ground in our graveyard, in the spare bathroom tub, punch bowl, and in various caldrons throughout the house. Remember to wear gloves when handling it. Keep it in a cooler or the freezer so that it will last longer. If you get it from an ice plant, etc. it will probably be in pellet form which makes it easy to spread around.